Hang in there baby! This plan includes patterns to built two different cats. One cat hangs from a fence, deck railing, or tree limb. 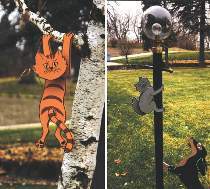 The other cat cluthes a standard 3-1/4" lamppost or you can even hang him upside down from a tree limb. Clutching cat can easily be made wider to fit other pole or tree limb diameters. Patterns for both cats drawn FULL SIZE.